Holbein’s career began in Switzerland, where he became known for portraying Erasmus of Rotterdam, author of In Praise of Folly. In the circle of the humanist Erasmus was also Thomas Moore, author of Utopia and chancellor of Henry VIII of England. Erasmus recommended Holbein to Thomas More to fill the position of King’s Painter. Holbein, before turning 30, was received in England by the court of Henry VIII. In the series The Tudors we can see the whole story. The artist usually portrayed the king’s court, the king’s lovers, landowners and several officials. The best known portraits painted by Holbein are undoubtedly those of Henry VIII. However, the painting The Ambassadors became famous for the composition and the motif it shows. While the portraits are closed in themselves, you can always find new interpretations in The ambassadors. The characters found in the work are presumably Jean Dinteville, a French ambassador, and Georges de Selve, a bishop, who also served as Ambassador of the Republic of Venice and the Holy See. Although there is debate about the identity of the characters, the National Gallery in London seems to have no doubts. 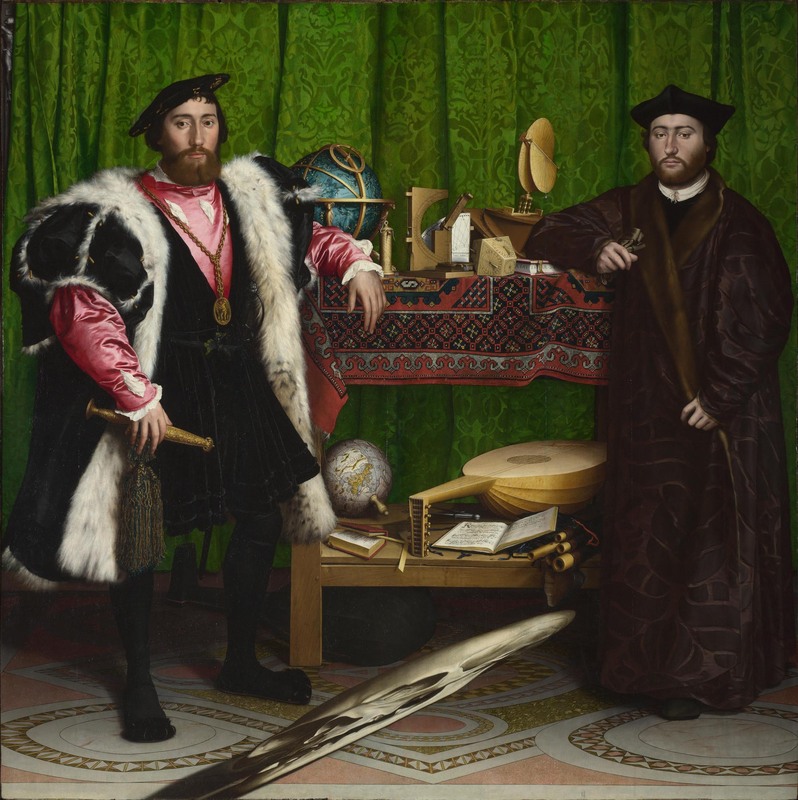 As you can see, Holbein fused portrait and still life in The Ambassadors. To interpret it, is necessary to understand the artist’s obsession with symbols. Both the two ambassadors and the objects can be interpreted symbolically. If we look carefully, the costumes of the ambassadors are radically different. While the French ambassador on the left uses couture, mundane clothing; the bishop wears a religious garb. The objects included are clearly differentiated from each other. On the shelf, in the upper level, we see elements that refer to heaven: a celestial globe (to study the stars), a quadrant, a Torquetum (an astronomical calculator) and more. On the lowest level, objects that refer to earth: a globe, books and musical instruments. 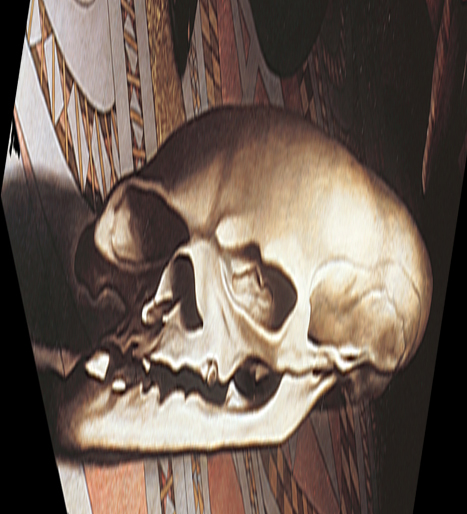 In the foreground, we see a strange diagonal, which is one of the most interesting features of the painting: a skull painted by anamorphosis, a technique where you draw a figure that can’t be identified when viewed from the front. It is only visible when it’s looked from another perspective. The ambassadors was supposed to be hung on the landing of a staircase, so the skull could be seen as you lower the stairs. Symbolically, the skull universally represents death. With these indicators, Holbein shows us the spiritual world at different levels of the painting: heaven, earth and hell. Men, between them, are among the eternal conflict of belief in a higher power or not. More information on the symbols, here. ~ by Álvaro Mazzino on May 18, 2012. Excellent. My interest in Holbein and the court of Henry VIII stems from Anglican religious and my English and Norman ancestry. Further, I taught courses in the humanities for several years in a community college. I love art and the discussion of art at every level and time in history. Thanks for your blog. but no one’s going to buy a salad when a burger costs less and is more filling. box of pasta and feed 6 people from it at a cost of about $0. reduced. A garden hose can also be used to check for proper flow. The idea iss too prevent the water dripping down the roof from accumulating in the house. YOU ARE THEREBY THE VERY ONES INSISTING UPON MAKING HELL–YOUR FINAL AND IRREVERSIBLE DESTINATION. I know this web page presents quality based articles and other material, is there any other web page which provides these kinds of information in quality? experiencing difficulties with your RSS. I don’t understand the reason why I am unable to subscribe to it. If you want to increase your familiarity only keep visiting this web page and be updated with the latest gossip posted here. as people think about worries that they just do not realize about. This entry was posted on May 18, 2012 at 15:35 and is filed under Renaissance.You can follow any responses to this entry through the RSS 2.0 feed.You can leave a response, or trackback from your own site.